Seems like it should be so easy to add a button on your PDF form so that the recipient can attach a file (.docx, .xlsx, .pdf, etc). After all, you can do this with an HTML form created in Adobe FormsCentral. It’s also easy to do if all the form recipients are using Acrobat, but not if they’re using the free Reader. However, the release of Adobe Reader version XI has made this just a tiny bit easier. First, I should mention that the ability to add file attachments while using the free Adobe Reader has been possible for a while. However, it requires the purchase of a server-based product called LiveCycle Reader Extensions, which can be rather expensive. But, for enterprise organizations that need this capability, it’s a worthwhile investment. On the other hand, for a few simple forms, it may be cost prohibitive. So, I’ll walk through a few alternatives. First, if all your form recipients are using Adobe Reader version XI and they’re only adding PDF attachments, you can use the technique outlined in Donna Baker’s tutorial on How to create a button form field to insert a PDF file. Now, if you need to include other types of attachments like .docx or .xlsx files then the only option is to offer a manual workaround. This manual workaround comes to us from Acrobat Expert George Johnson. What you can do is direct form recipients to use the Attach File comment tool located under the Comment pane > Annotations panel. 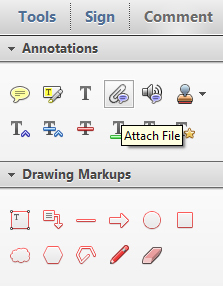 These comment tools have been part of Acrobat for years and only recently included in Adobe Reader XI. Now, this particular command is a bit obscure, so form recipients will need some guidance on how to use it. What you can do is create a non-printing button that displays an instructional message. To create the button in Acrobat, open the Interactive Objects panel under the Tools pane and select the Add Button command. 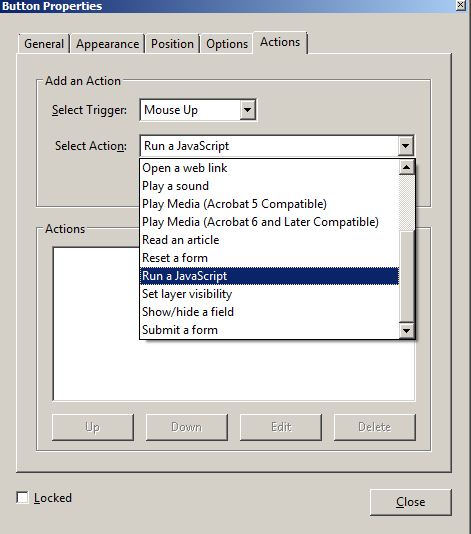 Move your cursor onto your form, and click once to place it. 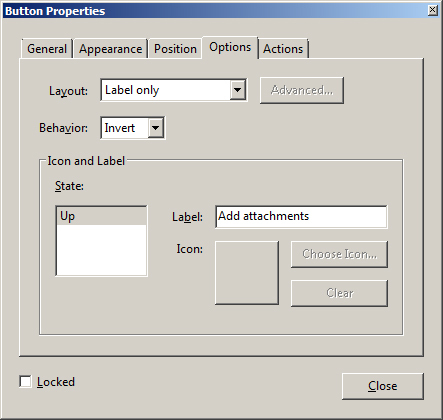 Give the button field a name, and click on the All Properties link. 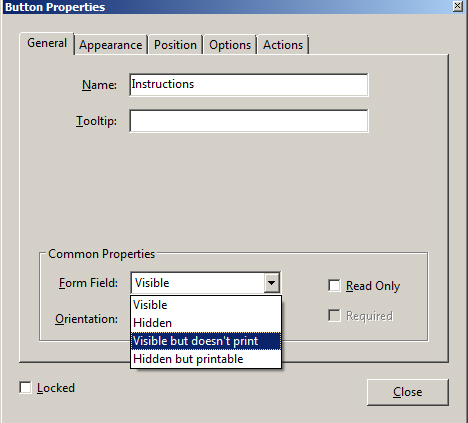 In the Button Properties dialog, select Visible but doesn’t print from the Form Field: dropdown under the General tab. Next, click on the Options tab and and select Label only from the Layout: dropdown to add a text to the button. I’ll label mine “Add attachments”. Test the button by selecting the Hand tool and clicking on the button. You should see the following alert. To utilize this manual workaround in earlier versions of Adobe Reader, the form will need to be reader-enabled first. Reader-enabling a PDF file is subject to the terms and conditions set forth in the Acrobat EULA. Also, at the beginning of this article, I mentioned that Adobe FormsCentral allows you to add attachments to HTML forms and this is detailed in Donna Baker’s tutorial on How to add attachments to a FormsCentral form. One caveat to be aware of however, is that the attachment feature will not work if you download and distribute your form from FormsCentral as a PDF. Instead you’ll need to utilize the manual method of using the Attach File command outlined above. If you would like to learn more about form techniques in Acrobat XI check out my session on Adding and Editing Form Fields in Learn Acrobat XI on Udemy.com. Beware: unlike “real” attachments, a PDF embedded as an icon in a button is not exported with other data when the form is submitted. Excellent point, as always JR! Actually it can be included in the exported data, as long as you explicitly include the button in the list of fields to submit and use FDF as the export format. A button can only contain a single flattened page (text, graphics, images) from a PDF, not an entire PDF file. You will also need to use something like the FDF Toolkit to extract the button icon and save it as a PDF. Any information on how to add “Attach a file” as an action item for buttons?